Home → Uncategorized → Can you describe your perfect customer? If you truly know the answer to this question for your business, its products and its services, then you most likely can coin your own money, stop wasting a LOT of time and think of the 4-hour work week as a very long week of work. Why? Because your description (let’s call it your ideal client profile) would act as a filter for every lead, every opportunity, every phone call, email… well, everything. Taken to it’s logical extreme, you would be able to determine, with some degree of certainty, a prospective customer’s projected lifetime value before you devoted your precious resources. It’s why companies invest in customer research. In fact, research is core to the methodology we bring to all of our client work (please see Summary report, left). Does your company periodically conduct research to get a pulse on the market, to learn how your customers evaluate and buy your products and to better understand the vital role your Channel Partners play? Or is your company’s approach a combination of trial and error, assumption and guesswork? A number of years ago I met John Coe, the guy who came up with BANT, an acronym describing the four components of a customer profile. Others, like Bob Apollo, have suggested updates to BANT, but for the most part, it’s stood the test of time and is certainly a good place to begin. If you’ve watched the video on our home page you know I use BANT to describe a qualified-decision maker. An ideal client has Need, Budget and buying Authority; the prospect meets your criteria for being a customer, and has a buying Timeline that falls within the time horizon of the sales rep’s commission plan. (most people forget the last part or think that “Time” has to do with product availability or budget cycle. John Coe cleared that up for me. BANT shines once you have a client in your sites. You have to have an exchange of information in order to know Need, Budget, Authority and Timing. Your customer profile (or as I like to call it, your customer qualification matrix) incorporates demographics with BANT. Where demographics is largely data-driven, your customer profile includes additional, detailed information, most of which is not generally available in a purchased or rented list and requires some level of human research. Here’s where the proverbial rubber hits the road. Your ideal customer profile can’t just work for your direct sales reps; it has to work for Channel Partner sales reps who rarely think about you. In fact, if your profile is tight enough, you should be willing and able to pay a healthy bounty to Channel reps just for introducing you to clients that meet your criteria. 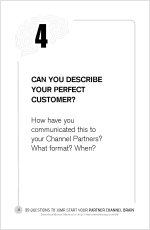 We did exactly this for a client after we completed our research, developed their ideal customer profile and road-tested it…. and the results were astounding.